With a focus to guarantee continuity of industrial processes in today’s world, Industrial Cyber-security has become paramount. Industrial Control Systems (ICS) infrastructure availability, integrity and security is a high priority for operating companies. Operating companies are being challenged in many ways to maintain an environment free of cyber threat and protected from vulnerabilities. These challenges are being driven by an evolution in ICS environment designs that bridge connectivity between business and ICS, the introduction of new technologies into ICS, and the sharing of maintenance and support responsibilities between IT and OT. IMPLEMENT. By applying our industrial cyber-security knowledge, business partner relationships, and experience gained from thousands of initiatives, we implement secure ICS solutions that match your ‘plant’ operational needs. Our solutions are designed to maintain resiliency, high performance and high availability in industrial systems with a secure, always-on, scalable, multi-technology network across business units and locations. We unify your OT infrastructure and lay the foundation for future technologies. COMPLY. No matter which security framework you have chosen, we provide critical consulting support to gather, manage, and report the evidence needed for you to demonstrate ongoing compliance with security related standards such as NIST, NERC-CIP, ISA 62443, and CSC20 for the ICS environment. Enhance your industrial cyber-security along with compliance. MANAGE. Our services are supported by the following ideologies: resource optimization; end-to-end security management; metric driven cost savings; and continuous improvement. These ideologies lay the foundation for our managed engineering service framework. All elements in the framework are in sync with these ideologies, providing you with a unified offering. As an extension of your ICS security operations, we focus on people, processes, and technology. The rising security risk to industrial systems and emerging compliance obligations place increasing demands on companies to assess and improve their cybersecurity posture. ENHANCE PRODUCTIVITY TO REDUCE MANUFACTURING AND OPERATIONAL COSTS. PLAN. By leveraging our experience in planning and designing solutions, we ensure that a new or existing infrastructure, compliance standard or service meets the needs of your OT/ICS organization. Specific processes are tailored according to each operational area, infrastructure need or service requirements (e.g. availability, integrity, security and commercial). Industrial Cyber-security Assessment for Critical Infrastructure: Our Cybersecurity Assessment for Critical Infrastructure service evaluates a broad spectrum of security controls, configuration, design/topology and technologies against best practices and industry standard security frameworks. It helps to determine the effectiveness of those controls and technologies are in protecting your organization from cyber-attacks. As an outcome of the assessment, any weak security controls and areas of risk that exist in the ICS environment will be fully articulated. Recommendations will be provided to implement those control changes and to help establish a stronger security posture that will be more effective at protecting your organization against cyber threats. Architecture & Design: Leveraging our rich expertise and understanding in the ICS environment, we design and architect solutions to maintain resiliency, high performance, and high availability with a secure, always-on, scalable, multi-technology infrastructure across business units and locations. Our strength lays in our ability to separate and segment your OT infrastructure and to lay the foundation for new technologies that can make your organization more secure and more manageable. Process Transformation: Cybersecurity in the ICS environment can require corresponding process and policy changes in support of those technical solutions. Without clear accountabilities, responsibilities, monitoring, training and reporting, both real and perceived issues can arise creating doubt and potentially significant operational impacts. Defining critical processes along with corresponding training, reporting and performance management ensures that OT environment aspects such as technical changes, availability, integrity and security are fully managed and reported. IMPLEMENT. By applying our knowledge, business partner relationships, and experience gained from thousands of initiatives, we implement secure ICS solutions that match your ‘plant’ operational needs. Our solutions are designed to maintain resiliency, high performance and high availability with a secure, always-on, scalable, multi-technology infrastructure across business units and locations. We unify your OT infrastructure and lay the foundation for new technologies. Servers and Virtualizations: We design and implement robust and manageable server infrastructures for your ICS/OT environment by consolidating your server resources in a virtual environment, reducing operational costs and hardware inventory, improving availability and simplifying the critical task of disaster recovery. Storage, Backup and Recovery: A well-crafted cybersecurity defense strategy anticipates a breach or failure of systems that control and monitor your industrial and infrastructure processes. Do you have a plan and the appropriate technology solution to help you respond quickly to a system loss? Dexcent offers best-in-class storage, backup and recovery solutions that utilize the appropriate mix of technologies and understanding of your OT environment. Networking: A properly designed network is a foundational pillar for a secure OT infrastructure. We have proven expertise in (re)designing and segmenting mission-critical ICS networks underpinning live industrial operations. We can help you establish proper electronic boundaries, implement appropriate security zones, segmentation, conduits and bring your industrial network in alignment with industry accepted architectural models. Field Telecommunication Networks: A reliable operationally-focused system can be largely dependent on a robust and secure field telecommunication network. Dexcent extensive expertise includes the implementation of VSAT, Cellular, Microwave, MPLS, and Wireless mesh networks across geographically remote critical infrastructure. Secure Mobile Remote Access: How critical operational assets are accessed and managed is essential to securing today’s ICS environment. Internal access control, and especially external (remote) access control should be well understood, managed, and actively monitored for intrusion detection and other anomalies. Combining consideration of availability and integrity with the unique nuances and attributes often found in ‘purpose built’ systems, Dexcent can implement secure, compliant solutions to support your field staff, vendors and management to maintain a high availability and proper functioning ICS environment. MANAGING COMPLIANCE TAKES RESOURCES, BUT IT’S NOWHERE NEAR AS EXPENSIVE AS THE COSTS ASSOCIATED WITH A BREACH. COMPLY. No matter which security framework you have chosen, we provide critical consulting support to gather, manage, and report the evidence needed for you to demonstrate ongoing compliance with security related standards such as NIST, NERC-CIP, ISA 62443, and CSC20 for the ICS environment. Evidence Collection & Compliance Documentation: ICS Cybersecurity Evidence Collection and Compliance services is about utilizing our team’s experience to gather, manage, and report on the security standards defined by your ICS Cybersecurity program including legal mandates, contractual obligations and/or internal polices and standards. Our attention to Cybersecurity compliance has resulted in the resolution of assurance and security issues for our clients. Integrated Cybersecurity Solutions: Increasing the overall security posture of the ICS environment in todays complex automation environment continues to be a challenge. We understand the fit-for-purpose nature of this highly complex environment. Being vendor and OEM neutral allows Dexcent’s team to design solutions which are unbiased, non-proprietary, standardized, flexible and expandable. Using an industry leading platform, we can facilitate an ICS-wide view of the real-time health of your ICS Cybersecurity environment providing unrivalled situational awareness of your ICS infrastructure. MANAGING EVERY EXPERIENCE THAT MATTERS. MANAGE. Our services are supported by the following ideologies: resource optimization; end-to-end security service management; metric driven cost savings; and continuous improvement. These ideologies form the foundation of a phased and managed engineering service framework. All elements in the framework are in sync with these ideologies, providing a unified offering. Field Engineering: Our Field Engineering Services support your industrial technology requirements from deployments and upgrades to moves, maintenance, replacements and removals. We understand no two organizations are the same, so our services are customizable based on the needs of your business. As your ICS cybersecurity matures, you may no longer require full-time technical support. Leveraging the capabilities of Dexcent’s on-demand field service team allows you to both reduce cost and improve coverage. Remote Network Management: Many organizations are faced with budget constraints and a shortage of skilled resources with the appropriate knowledge to maintain their mission-critical OT networks. 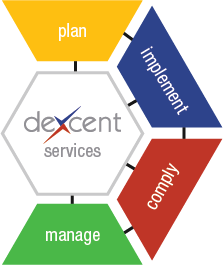 At Dexcent, we are committed to cost-effectively administering and supporting your OT networks as we promptly respond to the changing operational needs of your organization. We have broad technical capabilities that cut across multiple vendors and technologies. Remote Server Management: Keeping the plant’s OT systems running can span numerous tasks that consume limited resources. We can help effectively administer and maintain your server and compute infrastructure in a cost-effective way. We have a broad range of skillsets that cover data center virtualization, patch management, anti-virus, Active Directory (AD) services, server security hardening, as well as backup and recovery of servers according to disaster recovery policy requirements. Security Compliance Management: If your organization has developed an ICS cybersecurity strategy that aligns with business objectives, then compliance and assurance activities aim to ensure your organization’s continuous commitment to working within the required operational and legal guidelines. Vendor Support: Vendor Support reduces downtime by streamlining problem identification and resolution across your ICS/OT environment. Your OT staff will spend less time coordinating multiple security / compliance support issues and more time on critical operational needs. You will get the most from your existing system by more effectively bringing efficiency and reducing OT security complexity. Dexcent can provide a single point of contact spanning across your vendor and licence support and management control.